MLK Jr. and Ella Baker fundamentally disagreed on leadership in the movement. Baker found King controlling. Similarly to her experience at the NAACP, Baker grew irritated by difficulties in coordination and organization at the SCLC. She also found the competing, authoritative leadership styles of MLK Jr. and other black male ministers frustrating and counterproductive. Ella served two terms as Acting Executive Director for the NAACP, but she continued to clash with MLK Jr.2 She found the famous leader too controlling and not empowering enough. As Ella explained, “I wasn’t one to say yes, just because [an idea] came from Dr. Martin Luther King, Jr. I was not an easy pushover… It’s a strange thing about men,… if they haven’t ever had a woman say no to them, they don’t know what to do sometimes.”3 As Professor William Chafe of Duke University notes, Ella called leaders like King “prophets with feet of clay”, that did not bring the movement far enough by inspiring others. Watch Professor Chafe explain Ella’s significance as the Mother of the Civil Rights movement below. 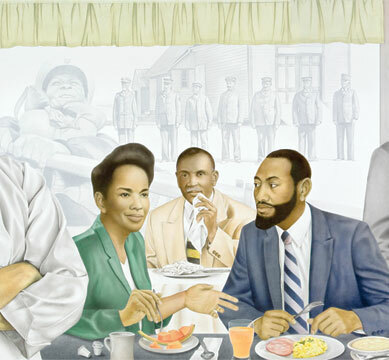 Leaders Ella Baker, James Shepard and William Smith portrayed at a counter sit-in; artwork at UNC. 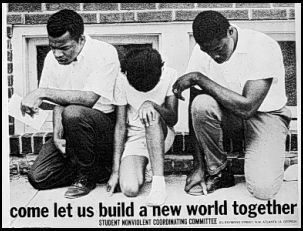 One of SNCC’s first promotion posters. SNCC was Baker’s brainchild to spark activism in the youngest generation. A collection of Baker’s own pins, demonstrating her work with the SNCC organization. 1. “Helping found the SCLC.” Oral History Interview with Ella Baker, April 19, 1977. Interview G-0008. Southern Oral History Program Collection (#4007) in the Southern Oral History Program Collection, Southern Historical Collection, Wilson Library, University of North Carolina at Chapel Hill. 2. Ransby, Barbara. Ella Baker and the Black Freedom Movement: A Radical Democratic Vision. Chapel Hill: UNC Press. 2005. 4. “Male SCLC leaders tend to ignore the contributions of women leaders.” Oral History Interview with Septima Poinsette Clark, July 25, 1976. Interview G-0016. Southern Oral History Program Collection (#4007) in the Southern Oral History Program Collection, Southern Historical Collection, Wilson Library, University of North Carolina at Chapel Hill. 5. “Helping found SNCC.” Oral History Interview with Ella Baker, April 19, 1977. Interview G-0008. Southern Oral History Program Collection (#4007) in the Southern Oral History Program Collection, Southern Historical Collection, Wilson Library, University of North Carolina at Chapel Hill. 6. Baker, Ella. Encyclopedia of Race and Racism. Editor John Hartwell Moore. Vol. 1. Detroit: Macmillan Ref USA, 2008. p147-148. 7. “Ella Josephine Baker.” Zinned Education Project. Teaching for Change and Rethinking Schools. 2013.